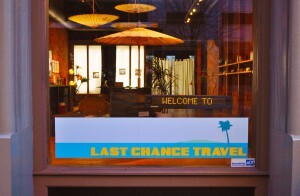 The Last Chance Travel storefront was located in a former high-end jeans store in downtown Seattle, WA. 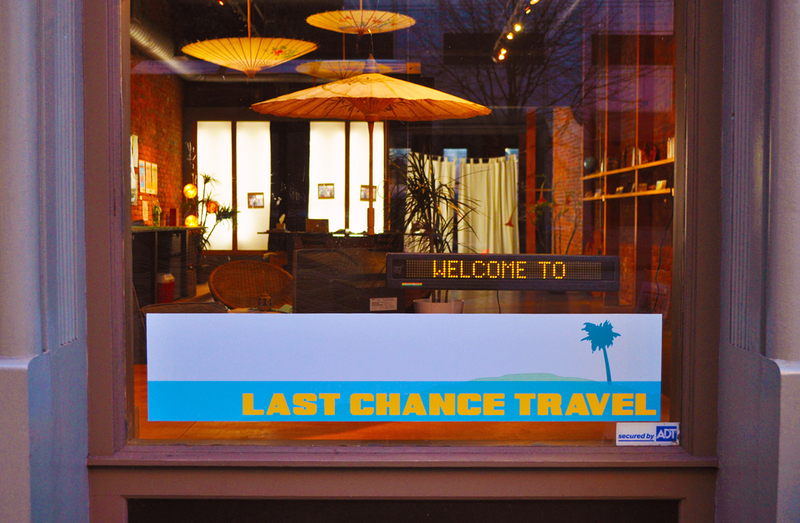 Watermark was a series of performances and installations with Vaughn Bell and Nicole Kistler about the potential impacts of climate change in Seattle. The Watermark actions marked the “new” Seattle waterfront that would be created in the case of a 20 foot sea level rise (as would happen if either the Greenland or Antarctic Ice sheets were to melt). Participants walked along this imaginary waterline, marking it with ephemeral materials such as seeds and melting blocks of ice. The walks were meditation and a demonstration on the need for action locally, nationally, and globally to stem the tide of climate change. The first Watermark action took place on April 14, 2007 as part of Stepitup2007 actions, and repeated on Earth Day a week later. It continued as part of the show “Groundtruthing” at SOIL Art Gallery in August 2007, and was featured in EPA: Environmental Performance Actions at Exit Art in New York in 2008. The First Watermark Action, April 14, 2007. Using sunflower seeds to mark the downtown shoreline in the case of 20-foot rise in sea level.